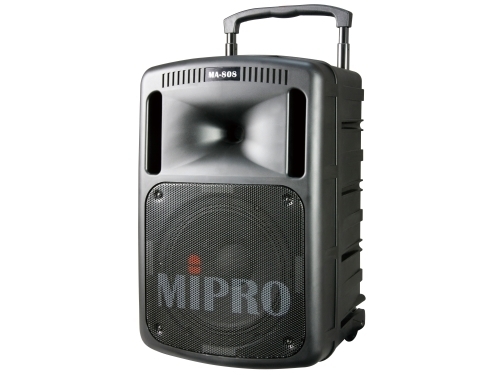 MIPRO products are designed for professional, commercial and consumer markets. The products are ergonomically designed, innovative, functional and in compliance to worldwide telecom and safety standards. MIPRO has introduced such innovations as the ACT (Automatic Channel Targeting) feature which facilitates simple frequency synchronization between receiver and transmitter, color LCD & VFD displays for clear viewing as well as the contour-shaped handheld transmitter microphones and fitted with high quality true condenser & dynamic microphone capsules for outstanding audio quality. The ACT-818 is a 1/2U single channel rack-mountable receiver with metal chassis. Full-color VFD (vacuum fluorescent display) for clear viewing of all parameters. All controls are intuitive and easily accessible, allowing for quick and easy system setup via a single rotary control. New digital diversity receiving technology eliminates signal dropout and enhances receiving range. Full-Range sound quality won’t be changed by the strength of RF signals or operation distance. Digitally-processed RF circuitry and DigitnamicPlus™ technology eliminates compander noise, assuring a wireless sound quality that easily rivals cable transmission. SPDIF Digital Audio Interface facilitates a direct connection to digital mixing consoles and transmits signal without distortion, ensuring a stable S/N ratio which will not deteriorate in long distance transmission. Proprietary 256-bit encryption, provides secure audio transmission, preventing unauthorized listening. 10 built-in SmartEQ™ presets and user-defined microphone capsule equalization allows faithful sound reproduction to suit artists’ preferences. 10 built-in digital anti-feedback SmartEQ™ presets minimize feedback effectively without sacrificing sound quality. Optional MIPRO RCS2.Net software allows real-time network remote-controlling and monitoring of 64 systems. Rugged 1-piece molded enclosure houses 1.5 " titanium compression driver & 10 " neodymium woofer. 190-watt power of loud and clear sound via high efficient high dynamic bi-amplified system. Industry’s only digital master volume control can be adjusted manually or wirelessly via a ACT-30Hr transmitter microphone. Industry first retractable handle and sturdy wheels for easy transport. Built-in storage compartment for 2 handheld or bodypack transmitters. Amplification from both wired and wireless microphones, MP3/CD players, etc. A voice priority feature that mutes the music when wireless microphone is used. Up to 4 diversity receiver modules can be installed for reliable, extended reception range. One-touch Scan & ACT sync buttons for fast and easy channel set-up. Built-in AC switching power supply/charger for universal usage and fast battery charge. Industry’s only MTM-90 wireless interlinking transmitter option to interlink multiple MA-708 wirelessly to extend transmission range and expand coverage without the mess of bulky speaker cables.